has a student which he taught demonstrate how the modern forehand is done. on the modern tennis game. Coach Kevin’s style is simple and direct. He will see how you hit your forehand and then make the necessary adjustments needed to make your forehand a modern one as you progress through each lesson. Coach Kevin spends his time looking at your form and he will videotape you so he can evaluate your stroke in more detail and give you in-depth feedback. I found this very helpful. Coach Kevin has taught me how to hit running forehands, approach shots and high balls using the modern techniques. These drills were very helpful because you have to deal with these type of shots in a game-like conditions. A drill that was an eye-opener for me was learning how to go around my backhand and hit an Inside -out forehand. 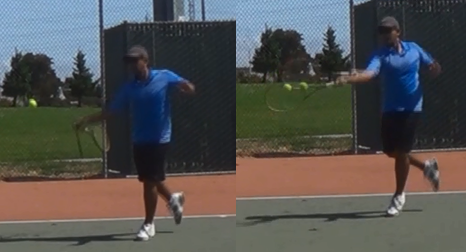 Coach Kevin showed me how to use my footwork to get in position to hit the inside- out forehand. I was never shown how to do this. If you interested in learning the modern tennis game , I highly recommend Coach Kevin to teach you the modern game. You will learn a lot and take your game to the next level. I took the 4 lesson package from Kevin and I would highly recommend him to anyone who wants to get better at tennis. Kevin’s passion for the game shines through and he truly cares about improving your game. He is willing to analyze any part of your game and his video analysis has been terrific & immediately revealed aspects of my forehand stroke that needed fixing! Hi Coach Kevin, i’m REALLY wanting to learn the modern forehand. I’ve been trying to learn it and feel I am improving but I would like to purchase a lesson package from you to work on my forehand. Can you email me the details of how to order a package with you and also do you offer online video analysis? Thanks!!! Hi! This is Kevin and basically you just give me the check for the package when we meet up in person. Or you can pay half the first time and the other half at the end. Or you can just pay up front for the hour(s) that day. I also do offer online video analysis! Message me via Kevin M. Nguyen on Facebook for further questions. I’ll send you a friend request.